With Karen Adams’ sophisticated notepads and daily planners, it’s hard NOT to stay organized. 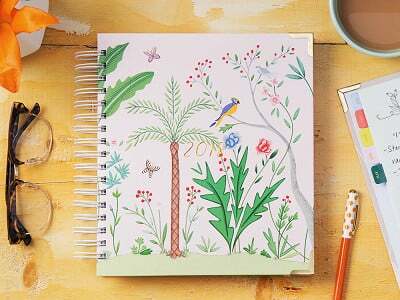 Her designs are a beautiful invitation to write, list, and map out the future. Each spiraled agenda is loaded with features that make it easy to gracefully plan your day—and plan ahead. Some of our favorites include: a “dates to celebrate” page, a “to-do for myself” section, a “must-see movies” page, and inspirational quotes to start each day. There’s even a “next week” section on Sunday pages, prompting you to start thinking about what’s ahead. We especially like that Karen includes cute illustrations-turned-stickers, too. They’re a colorful way to mark holidays, appointments, coffee dates, and other special occasions. And for more casual note taking, Karen also created an oversized, block notebook that’s completely Made in the USA. Karen studied apparel design at RISD, but it wasn’t until she went to Stationery Show in ’99 that she started designing these functional, elegant agendas and notebooks. We’re glad she did. What is the size of the planner and notepad? The planner is 9.5" x 9.5" and the notepad is 8" x 8". What are the materials of each? The notepad is made of 70 lb. vellum natural white paper and the planner is 70 lb. writing paper with coated paper-wrapped hard cover and metal spiral binding. 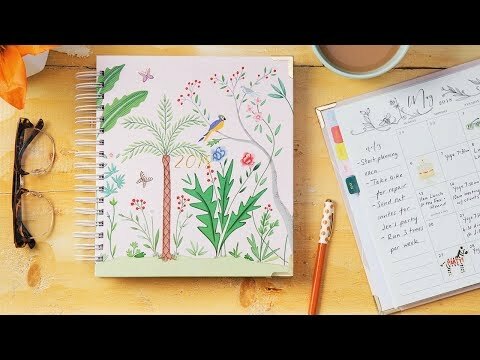 What features does the planner have? 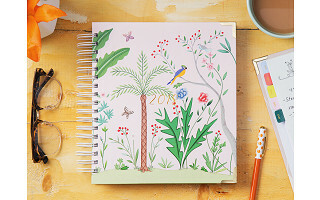 The daily planner features a sticker page for important dates and appointments, monthly and daily calendars, to-do lists, hourly schedules, daily goal sections, a "next week" section for weekly pre-planning, a password page for important passwords, and a section for general note-taking. With Karen Adams’ sophisticated notepads and daily planners, it’s hard NOT to stay organized. 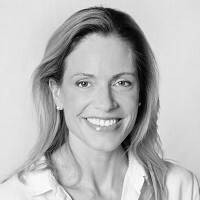 Her designs are a beautiful invitation to write, list, and map out the future. Each spiraled agenda is loaded with features that make it easy to gracefully plan your day—and plan ahead. Some of our favorites include: a “dates to celebrate” page, a “to-do for myself” section, a “must-see movies” page, and inspirational quotes to start each day. There’s even a “next week” section on Sunday pages, prompting you to start thinking about what’s ahead. We especially like that Karen includes cute illustrations-turned-stickers, too. They’re a colorful way to mark holidays, appointments, coffee dates, and other special occasions. And for more casual note taking, Karen also created an oversized, block notebook that’s completely Made in the USA.